I planned on making the million-mile club with my trusty ol’ Volvo. Although she was 22 years young, Cliff King told me he’d keep her running as long as I wanted. She had just turned 280,000 and I had not intention of ever getting rid of her. 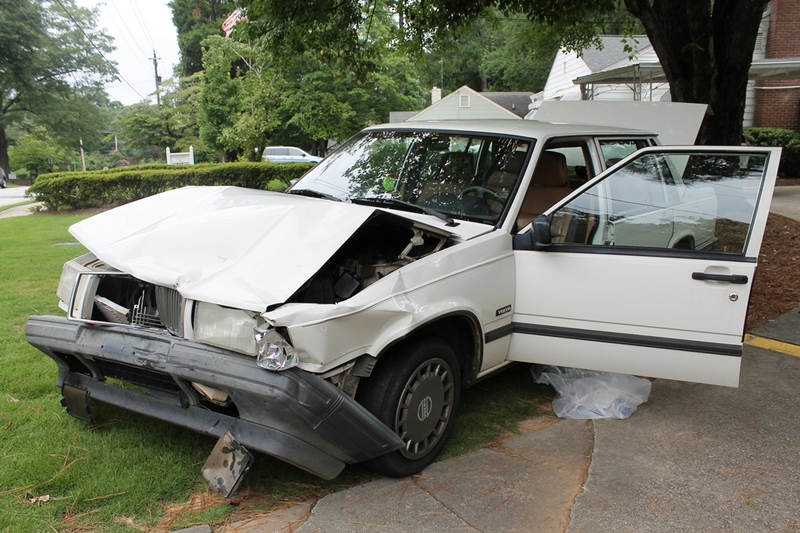 There she was, parked in front of Sage’s and Alex’s house in Decatur, minding her own business, and a big SUV going far too fast for a residential neighborhood, swerved across the street, rammed my best friend, and sent her into the yard of a day care center three doors down. She won’t be shuttling me where I want and need to go any longer and she won’t make the million-mile club. It breaks my heart because I truly loved my car; but, hey, I wasn’t out there packing her up to come home, there weren’t any moms, dads, or children on the sidewalk (which there usually are in abundance at any given time), and the auto that did the damage did not hit Sage’s and Alex’s home. I ventured outside a while ago to survey the scene of the accident and found the amber covers from her headlights and part of the trim from the side — and, yes, I am going to give them a prominent place among my favorite graffiti. All of you who know me know I don’t replace things until they break. My refrigerator is 23 years old, the washer & dryer are 18 years young, and Bessie, the Volvo, was 22 — but she sho’ got broke this morning and I guess I’ll have to replace her. But as with anything one loves, replacing is impossible…I can only find a substitute. 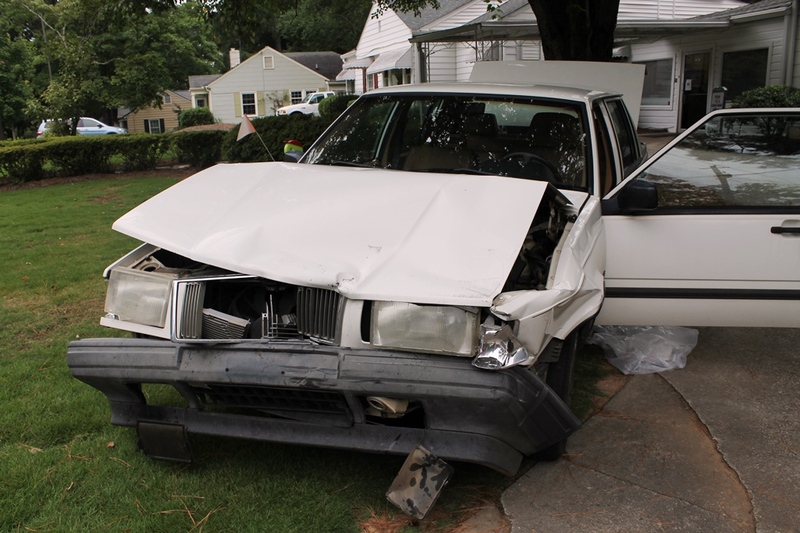 This entry was posted in Uncategorized and tagged accidents, million mile club, Volvo. Bookmark the permalink. so sorry . My red volvo wagon that I bought used when I was 40 made it until I was 53. She had 170,000. Sold her to someone else who only drove in town. Great car. Glad you are ok physically. We know the rest of the story. yep…all is fine…maybe it’s time for a new image, huh? Aww, bummer. My car has been hit twice just minding its business parked in front of my house, too, although not that badly. Ugh. Bummer for sure but I’ll make the best of this. As my son said: it is another random act that appears bad on the surface but which will turn out good…but I do seem to attract those weird random acts…hum??? I can believe it was just hit like that. Glad that no one was around or hurt. I know…I do attract some random acts of whatever!…all will be okay however — my next ride will be a good one!